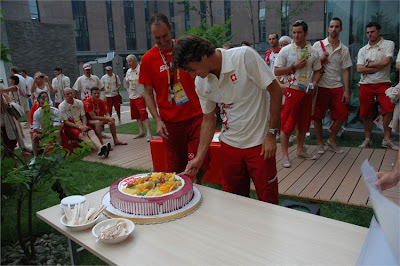 Wonder how Roger Federer celebrate his birthday this year? Here are a few photos for the fans out there. Esther, thank you for the tips. 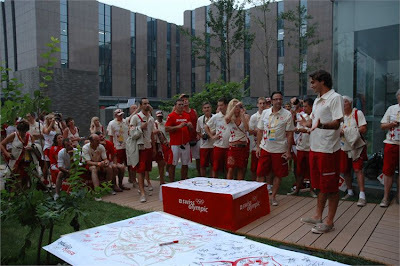 The entire Swiss team gathered and celebrated Roger Federer's 27th birthday before the Beijing Olympics Opening Ceremony, which he was the flag bearer for the Swiss team. 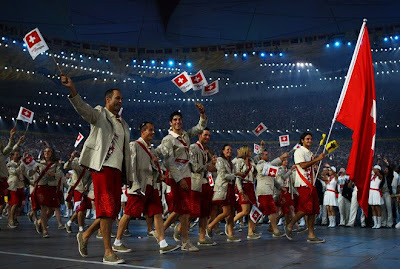 Everything was perfect for the Swiss team except their shoes. What to wear to win at the Beijing Olympics?